kickstones wrote: Hoi, I would class myself as a fairly average person and at the risk of appearing foolish, can you explain what would happen if you released water in the vacuum of space? Don't worry, kickstones. I'm the fool, here. I have no idea what would happen in the vacuum of space since I don't think we've been there. We may theorize, though (or fantasize, like in so-called "science fiction"). Hello Patrix, I understand the logic of no pressure and gases, what I'm trying to fathom out is what would happen to a sufficient body of water (liquid) emitted out of the rocket in space? If a means such as a steam explosion (see below), would the foremost water molecules emitted turn to ice, and if the latter molecules met the ice mass would enough thrust force be created to maintain momentum of the rocket? A steam explosion sprays steam and boiling-hot water and the hot medium that heated it in all directions (if not otherwise confined, e.g. by the walls of a container). If a steam explosion occurs in a confined tank of water due to rapid heating of the water, the pressure wave and rapidly expanding steam can cause severe water hammer. This was the mechanism that, in Idaho, USA, in 1961, caused the SL-1 nuclear reactor vessel to jump over 9 feet (2.7 m) in the air when it was destroyed by a criticality accident. Many large-scale events, including foundry accidents, show evidence of an energy-release front propagating through the material, where the forces create fragments and mix the hot phase into the cold volatile one; and the rapid heat transfer at the front sustains the propagation. Patrix, working on the assumption that a water carrying rocket managed to get into space, what influences would vary in that medium to the ground level vacuum water / ice experiment? For example, two phenomena documented to occur in space are solar radiation pressure and solar wind pressure, would they have any significant influences in water transformation and rocket mobility? kickstones » November 27th, 2017, 1:34 pm wrote: Patrix, working on the assumption that a water carrying rocket managed to get into space, what influences would vary in that medium to the ground level vacuum water / ice experiment? I'm flattered you ask me, but I can only speculate as much as anyone. Supposing space is as described, I have no idea if that is the case since most likely nothing man made has went above the atmosphere, and if something have, the last thing the people responsible would probably do is to give us any factual information of the nature of space. Anyway, if space is a vacuum, a water mass would “cold boil” (dissipate to a gas in low temperature), this in turn will make it colder as it’s losing heat in that process. And if space is very cold in itself I’m not sure if the water will freeze instantly or if it will be able to dissipate first and become small ice droplets. If water was ejected with pressure behind it, there might be some Newtonian inertia enabling the object ejecting the water to move in the opposite direction. But I find the “Newtonian explanation” of rockets laughable since inertia alone cannot produce any significant movement. To achieve that, there has to be an energy release that can react with the surrounding environment. Say, for example, you have a ship and instead of using the diesel to fuel the engines you start throwing or catapulting the diesel barrels from the back of the ship. That would hardly produce any motion. You have oversimplified this "barrel thrown off of ships" thought experiment. If you are wondering why a bunch of people chucking barrels off a ship would produce very little motion in the opposite direction despite Newton's laws of motion being correct it is because most of the force generated by the throwers of the barrels when transferred to the ship would be along the vector perpendicular to the horizontal motion of the barrels flying off the ship. This is because the throwers of the barrels are connected to the ship via their feet which primarily push through the vertical plane. So, the ship would experience an increasing bounce, but not much directional motion, and indeed were you to carry this experiment out you would notice much greater bobbing of this respective ship immediately during and after these barrels were being thrown. Yes, I may not be very good at giving thought experiments around this. Earlier ones in this thread have been better. But the point is that Newtonian laws are perfectly fine, it's just that they cannot do much in terms of propulsion. Another example would be if the ship was a destroyer and you directed and fired all cannons aft. High energy, high velocity, but not much propulsion. If you don't believe in the laws of classical mechanics, I don't have a problem with that, but if you do believe in them then I do have a problem with you claiming they don't cover all forms of motion. The ship destroyer example you cited has the same flaw in logic as your barrel example, except a ship firing a cannon will generate considerable directional motion in the opposite direction of the cannonball, the amount of this motion would depend on several factors the weight of the ship being one of them. However, let us turn to a much simpler example of propulsion, the fire cracker. Are you suggesting that firecrackers are not driven upwards by propulsion? "For example, a bullet fired from an M16 rifle has approximately 1763 Joules of kinetic energy as it leaves the muzzle, but the recoil energy of the gun is less than 7 Joules." "For example, a bullet fired from an M16 rifle has approximately 1763 Joules of kinetic energy as it leaves the muzzle, but the recoil energy of the gun is less than 70 Joules." In any case, to think that people will believe that a 100,000kg object (such as, for instance, the Space Shuttle) can be propelled by recoil alone - is still amazing to me. In that M16 rifle example, we see that the bullet (which we can compare with the fuel being ejected from the rocket) has approximately 1763 Joules of kinetic energy - whereas the recoil energy absorbed by / or impressed to the gun (which we can compare to the Space Shuttle itself) is less than 7 Joules. Less than 0.397% of the total, available 'explosive / propelling force' (less than 7 Joules) pushes against the gun. About 93.6% of the total, available 'explosive / propelling force' (1763 Joules) pushes against the bullet. The_White_Lodge » November 28th, 2017, 1:33 pm wrote: Are you suggesting that firecrackers are not driven upwards by propulsion? TWL and patrix, if you read the entire thread you will see those scenarios have been covered ad nauseam. Each force (wheels, water, air) pushes most efficiently against an external medium of the same nature. No need to go there again, unless you have found something that pushes against the void. For you to ask Patrix whether "firecrackers are not driven upwards by propulsion" - is frankly quite silly. No one here is denying that firecrackers are driven upwards, you see? And no one is denying that propulsion methods are possible - within our atmosphere. The question is: by WHAT SORT OF propulsion are firecrackers (or any skybound object) driven upwards? Is it solely "recoil propulsion"? For instance, all you need to be driven upwards (and thus defy / annihilate gravity) is to fill a balloon with hot air: it will get you up to max 40km or so of altitude. However, NO recoil force is involved with the ascension of a hot air balloon. Air -and only air (i.e. the interaction between colder and hotter air molecules) - is clearly the main 'actor' in this case. "Are you suggesting that firecrackers are not driven upwards by propulsion?" "Newtonian laws are perfectly fine, it's just that they cannot do much in terms of propulsion"
I cannot intelligibly make out what this statement was suppose to mean, but my best guess is that Patrix is supposing that either propulsion does not exist as a real phenomenon, or that it does exist but it is not governed by Newton's laws of motion. As Simon points out, your comments show that you need to go back to the beginning of this thread and start reading. And this time you will not presuppose you actually know the physics involved when it comes to rocketry. Read up on the things Boethius mentions like Joule-Thomson, free expansion etc. In another thread you bring up hypnosis, referring to it at as magic. I don't know if that is correctly understood by me, but the reason I bring it up is not because I want you to explain what you mean again but because I want you to understand and consider that you yourself may be under the spell so to speak. You are in good company because so was I less than a year ago. The lies around space and space travelling have been so carefully crafted that I know of only one man - Simon, that has been able to unveil them fully. If you are able to break free from this spell, to use your own language, you will for one find that the claims of rocketry working in vacuum is nothing but pseudoscience, mesmerizing images and empty claims that phenomena we can readily observe, like GPS and "Sattelite TV", cannot possibly work without them. I wish you good luck on your journey and hope you will be able to "break free". The keys to your mental prison have been handed to you thanks to the decades of work that Simon, Hoi and all the other fine Cluesforum researchers have carried out and documented on this forum. But only you yourself can put the key in the lock and turn it from the inside of your cell. Yelling for help on that part will only make it harder for you. Vaya con Dios White Lodge. First I want to point out that all kinds of ugly things happen on Wikipedia on a daily basis. Look into the revision story of any page to confirm that. Wikipedia keeps a history and anyone are allowed to make corrections. That said, I was able to pinpoint the change from 7 to 70 and it actually looks a bit odd. It’s an IP-address from India if I’m not mistaken (I may well be), and the only change made ever on Wikipedia from that address, which however does not say that the user assigned to that particular address have not made other changes under another IP since almost all IPs are dynamically assigned these days. Links below. Edit just so that not someone mistakenly thinks I’m defending Wikipedia: Undoubtedly much of the information is flawed and incorrect on Wikipedia. But I don’t think that is done intentionally. The crowds editing Wikipedia firmly believes the gospels from NASA and other sources and that is reflected there. But of course there are exceptions too, as with all generalizations. 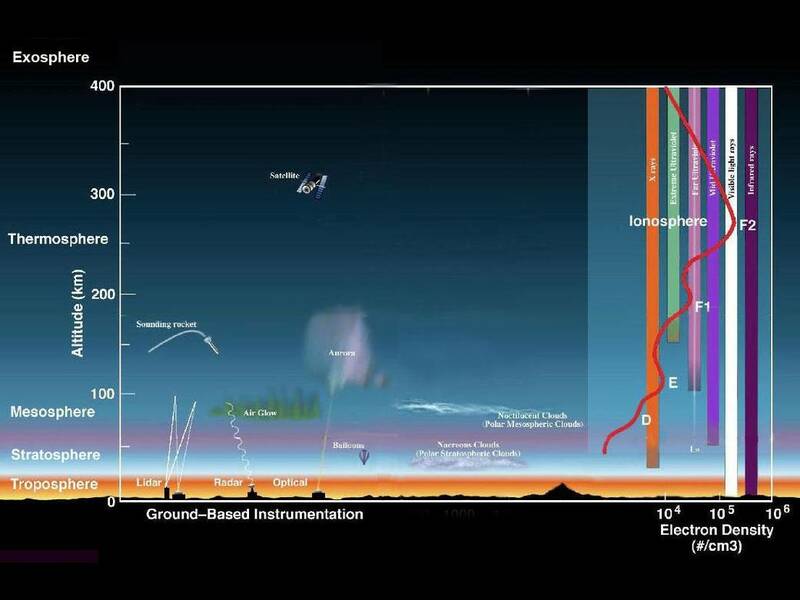 Patrix, I am inclined to agree with you about NASA spacecraft not being able to escape the earths atmosphere and apart from the satellite image I would say the NASA diagram below is fairly accurate. The diagram also gives me more of an understanding of the Project Highwater data mentioned earlier in relation to water expulsion in space and its relevance to the debate on propulsion of rockets in space. The troposphere starts at the Earth's surface and extends 8 to 14.5 kilometers high (5 to 9 miles). This part of the atmosphere is the most dense. Almost all weather is in this region. What is relevant to our water released in space scenario is the ionosphere and solar radiation absorbtion. "the ProJect High Water has provided essential Information relevant to a number of problems vital to --------- * explorations of space. Detailed knowledge of the dispersal of large quantities of liquids in space permits the determination of first order engineering parameters associated with an abort or explosion in space. Laboratory experiments simulating the release of water into the ionosphere have been carried out in a Space Environment Simulator (SES). These tests were performed with ambient pressures within the SES at 1.1 x 10-4 torr The pre-release chamber pressure was 1.4 x 10-4 torr. Following the release, the chamber pressure rose to 3.2 x 10-2 torr." Would the same result occur if water was released at the upper limit of our atmosphere (exosphere) and the boundaries of space where I would suspect solar radiation is at a greater level and the pressure would be less? I realise people state there's zero pressure in a vacuum because there's no matter to be pressurised and as such no reaction would take place but wouldn't that change once matter was introduced? removed allowing the fluid to expand into the evacuated region. In the lab experiment reaction of water exposed to minimal pressure took place rapidly. An examination of the film records showed that the water emerged as a multiplicity of minute droplets. These droplets rapidly dispersed. fraction of the droplets froze within five(5) milliseconds, and after 10 milliseconds, all of the remaining droplets were frozen. That there is now matter in the environment of space, ice droplets, would pressure be created on contact with them by solar radiation / solar wind? The solar wind is a stream of charged particles released from the upper atmosphere of the Sun, called the corona. This plasma consists of mostly electrons, protons and alpha particles with thermal energies between 1.5 and 10 keV. Embedded within the solar-wind plasma is the interplanetary magnetic field. The solar wind varies in density, temperature and speed over time and over solar latitude and longitude. Radiation pressure is the pressure exerted upon any surface exposed to electromagnetic radiation. Radiation pressure implies an interaction between electromagnetic radiation and bodies of various types, including clouds of particles or gases. The interactions can be absorption, reflection, or some of both (the common case). Bodies also emit radiation and thereby experience a resulting pressure. Johannes Kepler put forward the concept of radiation pressure back in 1619 to explain the observation that a tail of a comet always points away from the Sun. The assertion that light, as electromagnetic radiation, has the property of momentum and thus it exerts a pressure upon any surface it is exposed to was published by James Clerk Maxwell in 1862, and proven experimentally by Russian physicist Pyotr Lebedev in 1900 and by Ernest Fox Nichols and Gordon Ferrie Hull in 1901. A comet is an icy small Solar System body that, when passing close to the Sun, warms and begins to release gases, a process called outgassing. This produces a visible atmosphere or coma, and sometimes also a tail. These phenomena are due to the effects of solar radiation and the solar wind acting upon the nucleus of the comet. The coma is generally made of H2O and dust, with water making up to 90% of the volatiles that outflow from the nucleus when the comet is within 3 to 4 astronomical units (450,000,000 to 600,000,000 km; 280,000,000 to 370,000,000 mi) of the Sun. The H2O parent molecule is destroyed primarily through photodissociation and to a much smaller extent photoionization, with the solar wind playing a minor role in the destruction of water compared to photochemistry. Larger dust particles are left along the comet's orbital path whereas smaller particles are pushed away from the Sun into the comet's tail by light pressure. Would the above pressure created by solar wind /solar radiation have the same effect on a water releasing rocket and generate enough force to maintain continued momentum in space? Below is further information on the dynamics behind momentum of a comet, if correct and applied to a water emitting rocket in space it may help in determining if momentum beyond the earths atmosphere is plausible. The first article is a simplified explanation and maybe unsound because the so-called expert does tell of space travel while the second has complex physics and as my physics knowledge is not of the highest order others, more proficient, will have to scrutinise it for validity. Our friends at the Back Bay Astronomy Club in Virginia Beach, Virginia asked "What powers a comet?" Well, that's a very interesting way to look at comets. It does seem as if they must be under some kind of power like a rocket or a spacecraft with thrusters. Comets travel very fast, loop around the Sun, and have long tails. Because the comets are much smaller and lighter than planets, they are easily pulled this way and that by the gravity of the planets (or, in some cases, even by stars). So when we see them streaking through the solar system, they often aren't following the kind of neat, nearly circular orbits that most planets do. The solid part of the comet, its "nucleus," is like a dirty, hard-packed snowball with pockets of air trapped inside. When a comet's orbit brings it into the inner solar system, where you and I live, some of the ice and gas are heated by the Sun, and they expand to form a cloud around the nucleus. Although the nucleus may be only a few kilometers across, the cloud, called a coma, can be thousands of kilometers across—even larger than Earth. The coma blocks our view of the nucleus, just as a cloud blocks your view of an airplane flying inside it. Light and other radiation from the Sun push on the gas and dust in the coma, blowing the material away to form a tail that can be millions of kilometers long. Now imagine you are wearing a scarf on a windy day. The direction the scarf blows does not depend upon the direction you are walking—all that matters is the direction the wind is blowing. The tail of a comet is the same—it points away from the Sun, regardless of whether the comet is on the part of its orbit that is taking it toward the Sun or away. So one answer to what powers a comet is simply that the Sun does. It provides the heat that drives some of the material from the nucleus into the huge coma, and it provides the pressure to push some of that into the long and beautiful tail. Now what powers the comet's orbit? Well, comets formed in the rotating cloud that produced the solar system, so that got them started on their orbits of the Sun. (This is the same reason Earth and the other planets orbit the Sun.) We already know that the comets are so light that the planets yank their orbits around, sending them just about every direction in the solar system. But still another force acts on comets. When gases inside the nucleus expand under the heat of the Sun, they often shoot through holes or weak spots in the crust of the nucleus, like the steam coming through the hole in a tea pot. The expanding gas and dust escape in jets, having the same effect as thrusters on a spacecraft. This force, like letting the air out of a balloon, will change the comet's path, making its orbit hard for astronomers to predict precisely. Comet tails come in two flavors: the ion tail and the dust tail. The ion tail is thin, blue and linear - points directly away from the Sun. The ion tail is made up of ions (surprise!) - mostly CO+, N2+, CO2+. As the comet comes into the inner solar system, the Sun's radiation heats up the nucleus, "boiling off" and ionizing these gases. These ions are electrically charged particles, and interact with the sun's solar wind (charged particles coming from the sun). The interaction between the comet and the solar wind distorts magnetic field lines, causing a cometary magnetotail which points away from the Sun. The charged ions stream along the magnetic field lines in the magnetotail, so the ion tail always points away from the Sun. CO+ absorbs sunlight and flouresces, emitting energy at a wavelength of 4200 Angstroms, which is blue light. The dust is not necessarily charged -- why should the dust tail point away from the Sun? If a grain is big, it has a lot of mass, so gravity wins. If a grain is small, it has less mass and radiation pressure wins. When does this balance occur? Putting in typical numbers, we get R=0.006 cm -- small! Grains smaller than this will be pushed away from the Sun. Grains larger than this will be left behind along the comet tail (what will they become?). Actually, grains MUCH smaller than that won't absorb solar radiation as efficiently, so something else must be pushing on them -- solar wind collisions. Both radiation pressure and solar wind collisions are less effective at pushing on dust particles than magnetic fields are at containing ions, so the dust tail is broader than the ion tail, and it is not as precisely aligned away from the Sun as the ion tail is. Finally, the dust tail reflects sunlight, so it appears yellow/whitish in color.